The exhibition organised by the Project InterCommunication Center (ICC), founded by the Japanese telecom NTT, was a pioneering project investigating the implications of networked communication for the museum institution. The exhibition was only accessible to home users by means of the telephone, fax, and in a limited sense computer networking. It was meant as a model for a new kind of an “invisible” museum. Later it was followed up by another ICC exhibition The Museum Inside the Network (1995). The ICC opened its exhibition space in 1997. The works and messages from almost 100 artists, writers, and cultural figures were available through five channels. The works in “Voice & sound channel” such as talks and readings on the theme of communication could be listened to by telephone. The “Interactive channel” offered participants to create musical tunes by pushing buttons on a telephone. 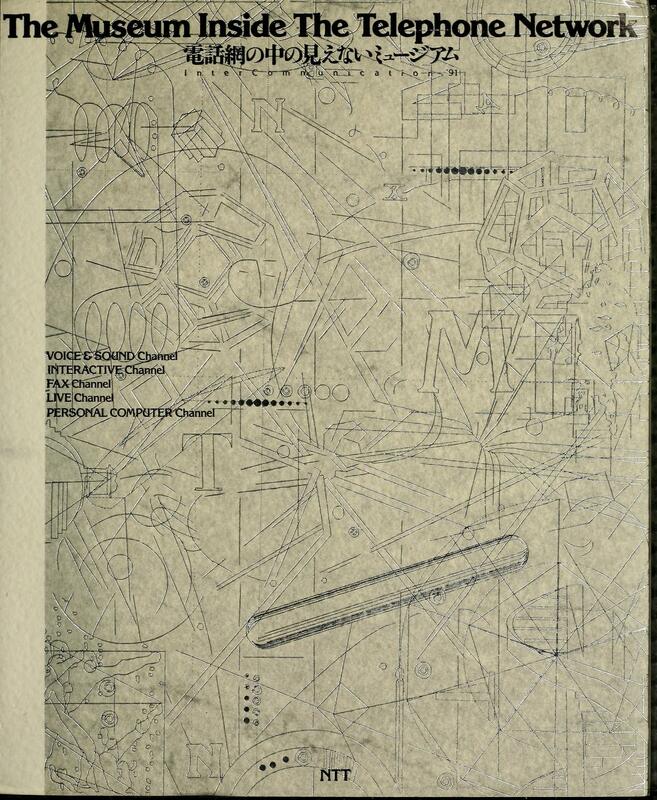 Works of art, novels, comics and essays could be received at home through “Fax channel”. The “Live channel” offered artists’ live performances and telephone dialogues between invited intellectuals to be heard by telephone. Additionally, computer graphics works could be accessed by modem and downloaded to one’s personal computer screen for viewing. Contributors include Laurie Anderson, J.G. Ballard, Christian Boltanski, Pierre Boulez, William S. Burroughs, Merce Cunningham, Daniel Buren, John Cage, Jacques Derrida, Allen Ginsberg, Philip Glass, Félix Guattari, Pontus Hultén, Derek Jarman, Jeff Koons, Daniel Libeskind, Jackson Mac Low, Judith Malina, Renzo Piano, Steve Reich, Ryuichi Sakamoto, Akira Sakata, Paul Virilio, Robert Wilson, Tadanori Yokoo, John Zorn, a.o. 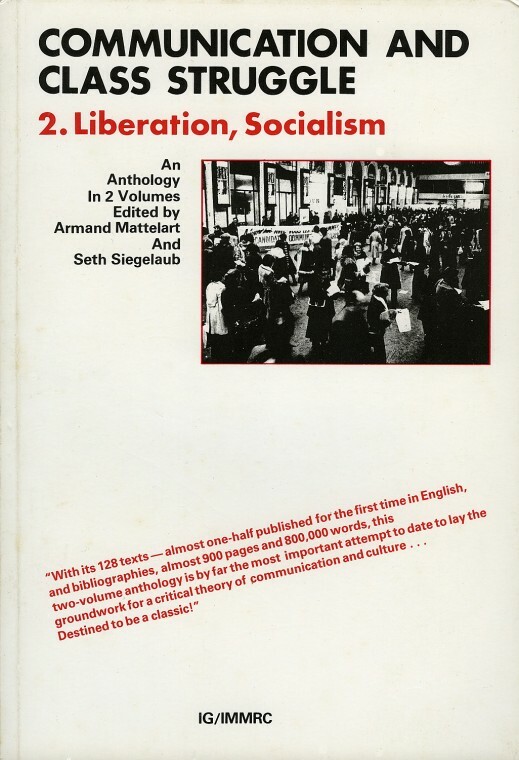 “Communication and Class Struggle, a two-volume work, is the first general marxist anthology of writings on communication, information and culture. Its purpose is to analyse the relationship between the practice and theory of communication and their development with the context of class struggle. 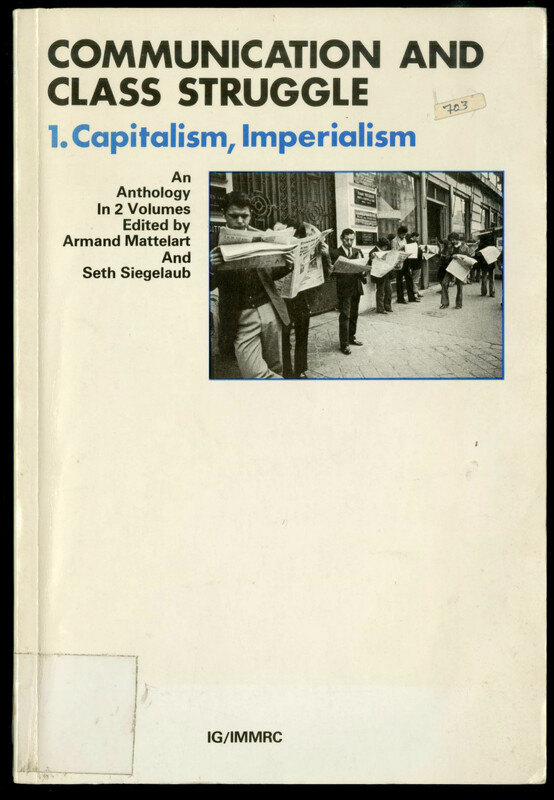 Armand Mattelart and Seth Siegelaub, the editors, have selected more 128 essential marxist and progressive texts originating in over 50 countries and written since the mid-nineteenth century to explain three interrelated phenomena: (1) how basic social, economic and cultural processes condition communication; (2) how bourgeois communication practice and theory have developed as part of the capitalistic mode of production; and (3) how in the struggle against exploitation and oppression, the popular and working classes have developed their own communication practice and theory, liberated mode of communication, culture and daily life. Review: Dallas W. Smythe (Journal of Communication 1985, p 218ff).